So far this week, I’ve meet many developers some who are working on JISC projects some not. Whatever their background though everyone has one thing in common. They all want to write code to make higher education a better place! The talks this week so far have been great. Monday I was in a crash course for n00bs to Python presented by Ben O’Steen, Brian Jinwright, Peter Sefton, and Rob Sanderson. This was a whole day of Python lovelyness. We covered test driven development, Google App Engine, Frameworks and lots lots more. That evening was the opening ceremony, I think the whole evenings shenanigans and tomfoolary can be summed up in this video. I think at this point we should give a big up to David Flanders for organizing the event! Tuesday 10th February 2009. I think we can write off the morning. After some great talks in the pub with some very cleaver people about very intellectual topics (that I can’t quiet remember), this left Tuesday morning a bit of a daze. However there was a great talk on Designing with sketches, paper prototypes and users by Mark van Harmelen. Now here we are Wednesday 11th February 2009. I’m just waiting for YouTube to finish off processing my interviews that I’ve been making about Dev8d. I will link to them here once they are done. Having to repost this as the network when down partway through the post. Damn you infrastructure! Using various twitter visualization sites, I thought I’d look at the impact the Developer Happiness Days was having on the World at large! Using the #dev8d hashtag and the @dev8d twitter user name I got the following results out. 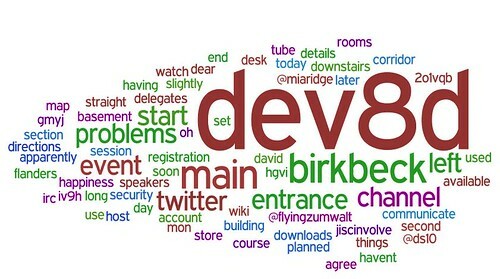 Yet another tag cloud type thing using the @dev8d username. A tag cloud of tag trends on Twitter. I like the fact that @dev8d is up there with the Grammy’s. A much more worth while event me thinks (Dev8d that is). 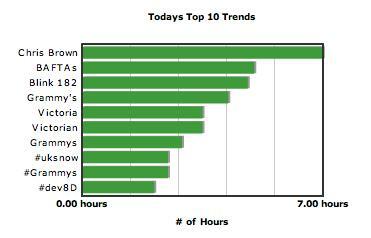 Ooh look a bar graph of Twitters top ten trends. All this data was grabbed yesterday (9th February). I asume that if I did it again today we’d be up there at the #1 spot! Well unless network outage takes us down again! Getting ready for JISCs Developer Happiness Days, which is a four day event for academic developers or anyone interested in the technical wizardry that happens in today’s modern higher education realm. The programme for the event looks great, with coding labs, technical sessions, workshops and more it is going to be jam-packed full of developer goodness. If your unable to attend the event, which has been painstakingly organised by the wonderful and energetic David Flanders then you can follow this event on one or more of the ever increasing social web spaces. 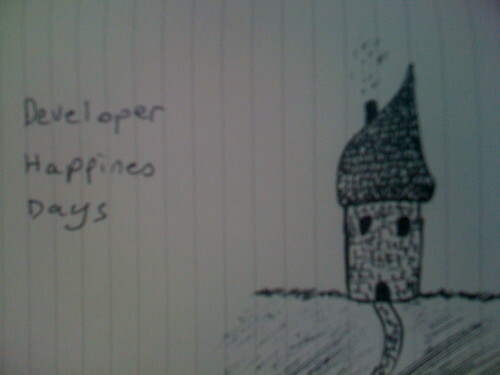 Furthermore if everything goes to plan, you should be able to follow this blog for the inside scoop of the Developer Happiness Days. Why is that you may ask, well the answer is that, this blog will aim to bring you; videos, tweets, snippets and generally all round goodness from this event; this will all happen by the magic that is the social web. So check back soon for some Developer Happiness Days updates. 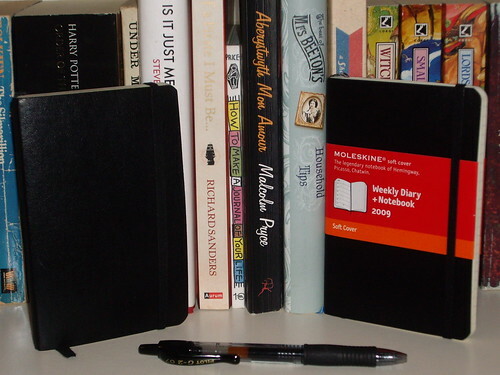 Moleskine Diaries, originally uploaded by Jools . This is a really great youtube video that I think everyone should watch.